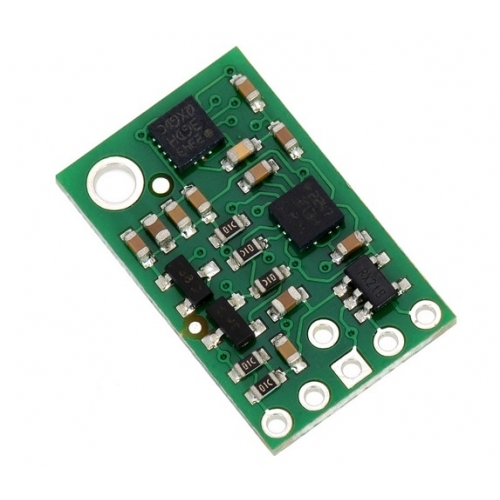 The Pololu MinIMU-9 V3 is an inertial measurement unit (IMU) that packs an L3GD20H 3-axis gyro and an LSM303D 3-axis accelerometer and 3-axis magnetometer onto a tiny 0.8″ × 0.5″ board. An I²C interface accesses nine independent rotation, acceleration, and magnetic measurements that can be used to calculate the sensor’s absolute orientation. 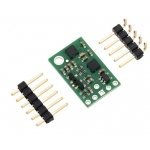 The MinIMU-9 v3 board includes a voltage regulator and a level-shifting circuit that allows operation from 2.5 to 5.5 V, and the 0.1″ pin spacing makes it easy to use with standard solderless breadboards and 0.1″ perfboards. 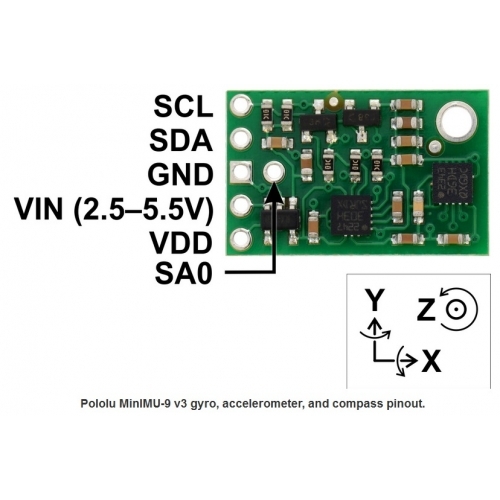 The Pololu MinIMU-9 V3 is a compact (0.8″ × 0.5″) board that combines ST’s L3GD20H 3-axis gyroscope and LSM303D 3-axis accelerometer and 3-axis magnetometer to form an inertial measurement unit (IMU); we therefore recommend careful reading of the L3GD20H datasheet (3MB pdf) and the LSM303D datasheet (1MB pdf) before using this product. These sensors are great ICs, but their small packages make them difficult for the typical student or hobbyist to use. They also operate at voltages below 3.6 V, which can make interfacing difficult for microcontrollers operating at 5 V. The MinIMU-9 v3 addresses these issues by incorporating additional electronics, including a voltage regulator and a level-shifting circuit, while keeping the overall size as compact as possible. The board ships fully populated with its SMD components, including the L3GD20H and LSM303D, as shown in the product picture. The L3GD20H and LSM303D have many configurable options, including dynamically selectable sensitivities for the gyro, accelerometer, and magnetometer. Each sensor also has a choice of output data rates. The two ICs can be accessed through a shared I²C/TWI interface, allowing the sensors to be addressed individually via a single clock line and a single data line. Additionally, the SA0 pin is accessible, allowing users to change the slave addresses and have two MinIMUs connected on the same I²C bus (For additional information, see the I²C Communication section below). 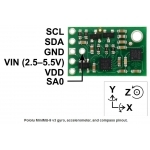 The carrier board includes a low-dropout linear voltage regulator that provides the 3.3 V required by the L3GD20H and LSM303D, allowing the module to be powered from a single 2.5 V to 5.5 V supply. The regulator output is available on the VDD pin and can supply almost 150 mA to external devices. The breakout board also includes a circuit that shifts the I²C clock and data lines to the same logic voltage level as the supplied VIN, making it simple to interface the board with 5 V systems. The board’s 0.1″ pin spacing makes it easy to use with standard solderless breadboards and 0.1″ perfboards. A 1x6 strip of 0.1 header pins and a 5×1 strip of 0.1 right-angle header pins are included, as shown in the picture below. VIN This is the main 2.5V – 5.5 V power supply connection. The SCL and SDA level shifters pull the I²C bus high bits up to this level. The L3GD20H’s gyro and the LSM303D’s accelerometer and magnetometer can be queried and configured through the I²C bus. Each of the three sensors acts as a slave device on the same I²C bus (i.e. their clock and data lines are tied together to ease communication). 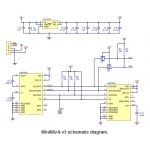 Additionally, level shifters on the I²C clock (SCL) and data lines (SDA) enable I²C communication with microcontrollers operating at the same voltage as VIN (2.5 V to 5.5 V). 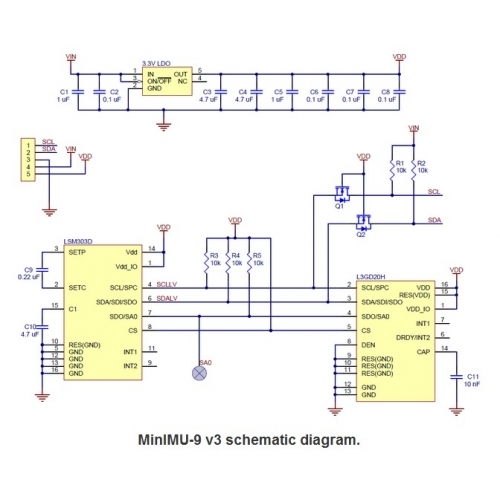 Both chips on the MinIMU-9 v3 are compliant with fast mode (400 kHz) I²C standards as well as with the normal mode. We have written a basic L3GD20 Arduino library and LSM303 Arduino library that make it easy to interface the MinIMU-9 v3 with an Arduino. They also make it simple to configure the sensors and read the raw gyro, accelerometer, and magnetometer data. 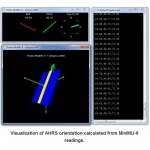 For a demonstration of what you can do with this data, you can turn an Arduino connected to a MinIMU-9 v3 into an attitude and heading reference system, or AHRS, with this Arduino program. 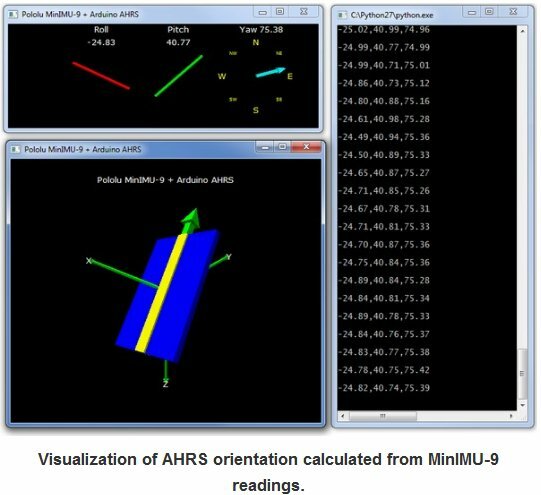 It uses the data from the MinIMU-9 to calculate estimated roll, pitch, and yaw angles, and you can visualize the output of the AHRS with a 3D test program on your PC (as shown in a screenshot above). 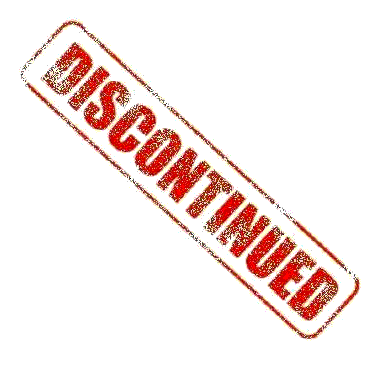 This software is based on the work of Jordi Munoz, William Premerlani, Jose Julio, and Doug Weibel. You can read or write multiple gyro, or accelerometer registers in a single I²C command by asserting the most significant bit of the register address to enable address auto-increment. The gyro, accelerometer, and magnetometer all output readings in a 16-bit reading (obtained by combining the values in two 8-bit registers for each axis).